Each pack contains 6 pillowcases of the same exact color. You cannot choose the color you receive. If you order multiple six packs you might get different colors (but each pack of 6 has the same color). They are 180 thread count 50% cotton 50% polyester pillowcases. 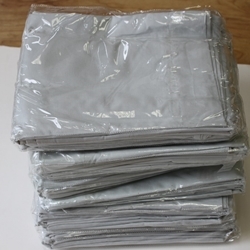 The pillowcases are approximately 21.5" wide x 30" long and fits a standard size pillow. It has a 2" hem on the open side. You will receive 6 pillowcases per pack. Imported. No return this is a closeout item. All are first quality. Note the photo is for illustrative purposes only and represents a few of the items available.